Three coiled serpent around the neck: What it symbolizes? 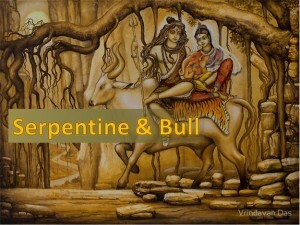 Lord Shiva′s use of the bull (Vrisha – righteousness) as his vehicle expresses the idea Lord Shiva takes us to path that leads to wisdom and knowledge. 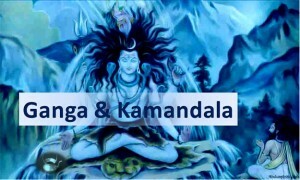 The river Ganga is the most sacred river for Hindus. Ignorance should not be an excuse to achieve good things in life. Ignorance can damage both mind and body. Blue Throat: What it symbolizes? 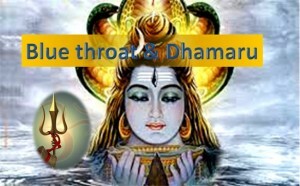 The music produced by dhamaru indicates the removal of all desire and evil from the body— making the body clean and disease free. Third Eye: What it symbolizes? 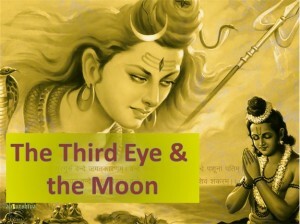 Lord Shiva also known as Thrayambaka because he has three eyes. Matted Hair: What it symbolizes? This releases stress from mind and helps mind to reign positive thinking and in developing proper intellectualism. 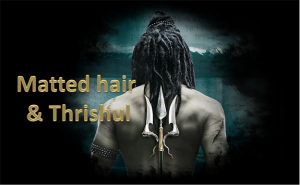 And Trishul (Trident) – What it symbolizes? 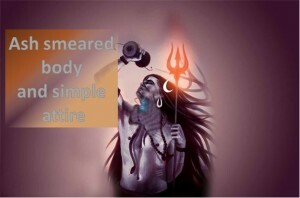 Click here to know..
Ash smeared body and simple attire: What it symbolizes? Only armed with a trishul and damru, Lord Shiva always stayed away from wealth. You are missing out on nothing in life if you’re not attached to wealth and materialistic things.